Ray Santos, a mambo legend and leader of the CCNY Latin Band, has been honored by the Latin Recording Academy. Mambo legend Ray Santos, the long-time leader of The City College of New York’s Latin Band, is a co-recipient of The Latin Recording Academy’s 2011 Trustees Award. He will be honored November 9 with fellow luminaries Manuel Alejandro and Jesus “Chucho” Ferrer at the Four Seasons Hotel in Las Vegas during the Latin GRAMMY® Awards celebration. The Trustees Award is a special honor whose recipients are selected by ballots cast by the Academy’s trustees. It recognizes individuals who have made significant contributions, other than performance, to the field of recording throughout their career. Known as “El Maestro” of the mambo sound, Mr. Santos has performed, composed and arranged music for dozens of premiere Latin orchestras in a career exceeding 50 years. Dr. Lisa S. Coico, President of The City College, hailed Mr. Santos as an incredibly talented musician who richly deserved the award. “He has taught at City College for more than 25 years and generations of students have been truly fortunate to have an opportunity to study with him. We are thrilled that the music industry is honoring his contributions, and, on behalf of the entire College community, I offer our congratulations on this achievement,” she said. Other notable honorees on November 9 will include icons Joe Arroyo, Gal Costa, Jose Feliciano, Alex Lora, Les Luthiers, Ruben Rada and Linda Ronstadt who will receive Lifetime Achievement Awards from the Latin Recording Academy. “This year's group of accomplished honorees are as diverse as they are influential creators of the most renowned and prominent recordings from across the globe," said Gabriel Abaroa Jr., president/CEO of The Academy. “We are privileged and honored to recognize and celebrate the contributions of these true icons to the world of Latin music. Their legacies have affected multiple generations and will continue to influence musicians and music fans for years to come." A New York native and graduate of The Juilliard School, Mr. Santos is one of the leading authorities on Afro-Caribbean music. His impressive credits in a career spanning over half a century have earned him the nickname “El Maestro” of the mambo sound. He has notably performed, composed and arranged music for dozens of premiere Latin orchestras. Mr. Santos has also produced music for numerous projects, including films such as “The Mambo Kings” and arranged music on Linda Ronstadt's “Frenesi” and Paquito D'Rivera's “Tropicana Nights,” both GRAMMY-winning albums. He has taught at The City College for more than 25 years and frequently lectures at colleges and universities throughout the United States. Among his many accolades are the Chico O'Farrill Lifetime Achievement Award and Bobby Capo Lifetime Achievement Award. 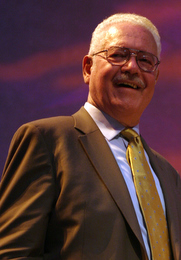 Mr. Santos was inducted into the International Latin Music Hall of Fame in 2003.